Starting a business requires many different moving pieces and the right financials to keep it running. While some startups are self-funded, others may be in need of investors or business loans. According to the National Small Business Association (NSBA), 33% of small business owners received no financing, while 64% received a bank loan. Today, more small business owners report they are able to obtain adequate financing than six months prior. There’s another funding option for businesses in need of a loan, and it’s a great alternative for those in search of fast funding. Headquartered in Atlanta, Kabbage exists to provide just that: funding for small business owners in as little as 48 hours. We spoke with Victoria Treyger, Chief Revenue Officer of Kabbage, to learn more about their intelligent platform and how they’re helping entrepreneurs get the funding they need. Founded in 2009 by Rob Frohwein and Kathryn Petralia, Kabbage used its first two years in business to build a brand-new lending platform for startups. Robert Frohwein, CEO and co-founder of Kabbage, recognized an opportunity to use verified third-party data to make faster and more relevant credit decisions based on the real-time performance data of a business. After those first years, Kabbage had issued their first business loan through their lending platform in 2011. What sets Kabbage apart from other online lenders is their ability to utilize real-time, third-party data to make fast and accurate credit decisions in a matter of minutes. “In three simple steps, small businesses can apply, qualify and access funding in less than 10 minutes with us,” Treyger said. By analyzing business performance, spending habits, online sales and accounting data from a variety of sources, the lender can provide long-term loans almost immediately. The alternative lender is also the only lending platform that allows small business owners to apply, qualify and access funding through a mobile app. The rise of API’s (Application Programming Interface) allows Kabbage to provide a hassle-free lending platform for small businesses where the application process takes only a few minutes, and the business relationship continues indefinitely. 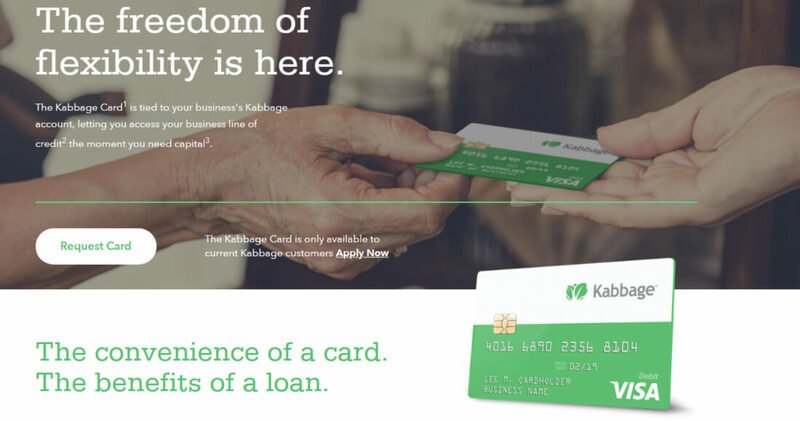 Not only does Kabbage provide direct access to capital through its lending platform, it also introduced a credit card in May of 2015 that’s unique to Kabbage. The Kabbage Card is not a traditional credit card at all. However, it does function like one where it can be used at a POS. Where it differs, though, is that each swipe, tap or dip of the card provides access to a six-month loan with the same flexible payback as any other loan serviced by Kabbage. Every time a customer uses the card, they are expanding upon their existing line of credit. The Kabbage Card is available to any Kabbage customer upon loan qualification, and there’s no charge to sign-up or annual fee. The card can be used online or in-store, and cardholders don’t have to wait for the funds to transfer into their account. This unique card puts the purchasing power of the customer’s credit line in their wallet for flexible and convenient access to their funds for business purchases. By partnering with banks worldwide, Kabbage has been able to expand its reach to thousands of businesses in the U.S. as well as the global market. The use of real-time, trackable company data has taken the stress out of applying for business loans and has replaced it with modern, fast-paced options that work well with the rapidly changing market. Following a business model that works, Kabbage is the present and future of small business lending. Looking forward, Kabbage expects to continue its personalized style of lending, but also expects data to become more widely available to the small business owners.